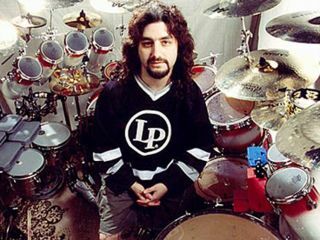 For a drummer, Dream Theater's Mike Portnoy can't seem to sit still. This much is obvious to anyone who's ever watched one of his riveting drum solos - performances so charged, you'd swear they were cases of demonic possession. But, as Portnoy readily admits, the only voices he answers to are his own - and the OCD-afflicted musician has plenty of them at all times. Which is good if you like to stay busy, and Portnoy certainly does in Dream Theater. He co-produces their albums, writes lyrics, designs artwork, oversees the website - he'd even watch the show with the audience if he could. In addition, Portnoy has formed progressive-rock supergroups such as Liquid Tension and Transatlantic and has performed with contemporary Christian artist Neal Morse. If that weren't enough, he's the heart and soul of several insanely happening tribute bands such as Yellow Matter Custard (The Beatles), Hammer Of The Gods (Led Zeppelin), Cygnus And His Sea Monsters (Rush) and Amazing Journey (The Who). "Those bands shaped who I am as a person and musician," says Portnoy. "Performing their songs strengthens that influence." During a North American Dream Theater tour, Portnoy checked in with MusicRadar to discuss his love of playing the music of his heroes, and to answer your questions.